Hello! 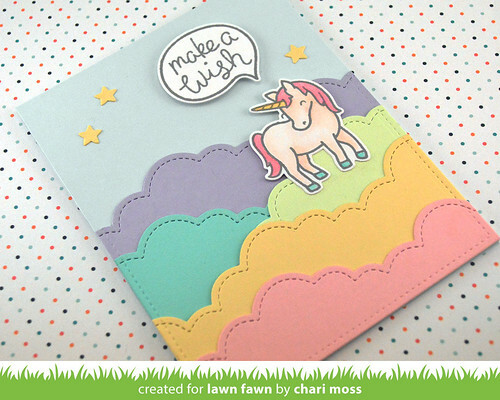 Back again with another Lawn Fawn Inspiration Week post! Today we are featuring some new dies. 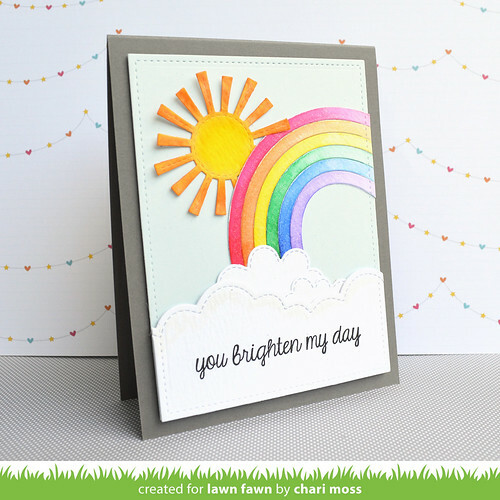 The new puffy cloud border dies, which are so fantastic, and the new rainbow die. 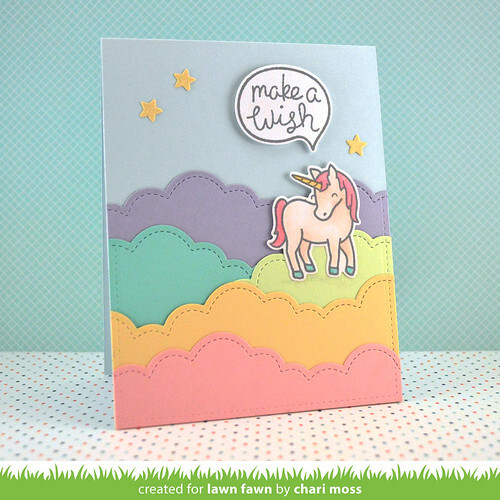 I used the middle size puffy cloud border die for this card, cutting different colors of pastel card stock and then layering them to create a magical place for my unicorn. I stamped the unicorn in Hippo grey ink and colored her with colored pencils. I used the make a wish sentiment from Chit Chat which I think is just perfect for this card and added a few stars cut with the star die in the 3x4 stitched journaling card die. I added some Wink of Stella glitter on the stars and below the unicorn for some sparkle. For my second card I used the new rainbow die to cut out some watercolor paper. I created a watercolor using Zig Clean Color real brush pens by coloring them on one end then blending them out with my water brush to a lighter shade on the other end. I gave the whole rainbow a coat of Wink of Stella clear glitter as well, it's hard to see in the picture. The sun was colored with Zig Clean Color real brush pens and water as well. For the clouds I layered some of the clouds from the Spring Showers die set behind the Puffy Cloud border die to create a layered 3D effect. 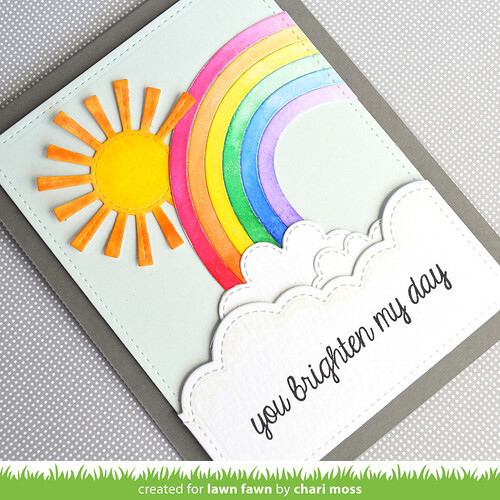 I finished if off with the sentiment from Summertime Charm which I think goes with this card just perfectly. Check out the Lawn Fawn Blog for more projects with these dies as well as giveaways. Chari, your unicorn card is just magical. I gasped when I saw it on my Feedly. Love, love, love. Love unicorn card its perfect for my daughters birthday thanks for the inspiration! Oh, oh, this card is so cute! The new cloud dies look great with the unicorn! The colors are gorgeous! Beautiful cards! Love those colorful clouds! These cards are so cute, Chari! The colored clouds with the unicorn is adorable! That unicorn is so cute! I love your creative ideas. They are both adorable! I love the idea of different colored clouds. Very cute card!